Veggie Revolution: New food book slams it home: "Healthy Eating, Healthy World"
New food book slams it home: "Healthy Eating, Healthy World"
I was recently asked to review the book Healthy Eating Healthy World. Imagining it to be a cookbook, I readily agreed. But when the book arrived in my mailbox, I was surprised to find not a cookbook but an impressive and comprehensive volume as to why humans must stop consuming animal products, and fast. I already have a number of books about the damage and suffering caused by the meat industry and the ingestion of flesh, eggs, and dairy. Consider Diet for a New America, Food Revolution, The Way We Eat, Forks Over Knives, Eating Animals, Animal Factory, The China Study, my own Veggie Revolution, among others. Why would anyone need another book on the subject? Is this one special? It is special. Healthy Eating, Healthy World by J. Morris Hicks is one of the very few books that cover just about every major argument that can be made for choosing a plant-based diet. The information in the book is documented by scientific studies, cited in Hicks' 306 footnotes. The book contains few if any brand-new revelations; rather, its merit lies in its tying together scads of information from disparate angles and sources. Hicks has painted the big picture - how livestock are no longer compatible with a viable future for a planet with shrinking resources and a mushrooming population. Nor are animal products improving our personal health and longevity. The first part of the book reviews the considerable health benefits of a plant-derived diet. Hicks summarizes the findings of Dr. T. Colin Campbell, co-author of The China Study, and the medical research of Dr. Caldwell Esselstyn, whose prescribed plant-based diet actually reverses heart damage in his patients. These specific health benefits of vegan dining have been described elsewhere, in the documentary Planeat for example, but warrant inclusion in Hicks' book as well. A plant-derived diet has been shown to reduce the likelihood of obesity, diabetes, heart disease, various cancers, and other ailments. Citing research, Hicks also dispels common myths about vegan diets, such as difficulty in getting enough protein, calcium, Vitamin B12, omega-3 fatty acids, and so on. Since health is a prime motivator among those who shun animal products, health was a good place for Hicks to begin his exposition. But the next part of the book is the dearest to my own heart - the section on how the meat and dairy industry impact our fragile planet. The most "special" aspect of Hicks' book to me is his description of how the livestock sector is accelerating the oncoming freight-train that will entirely derail modern society - the ominous but inevitable "end of oil." From the oil-based fertilizers for feedcrops to the refrigerated trucks that transport packaged loins and rump roasts, the animal-product industries consistently slurp down 30% of the oil used on the planet. Your switching to an animal-free diet will do more to protect our oil reserves than switching to a hybrid car. Hicks of course addresses the standard environmental complaints about the meat industry - deforestation for grazing and the cultivation of feedcrops, pollution from the 9 truckloads of livestock waste per year per person in the U.S., and the volume of greenhouse gases resulting from the creation and distribution of animal-products. Hicks also has a chapter entitled "Hell on Earth" that reports on the unrelenting misery of animals raised on factory farms, a well-documented fact by now, which I photographed and wrote about myself (with my co-author) in Veggie Revolution and Going Green. 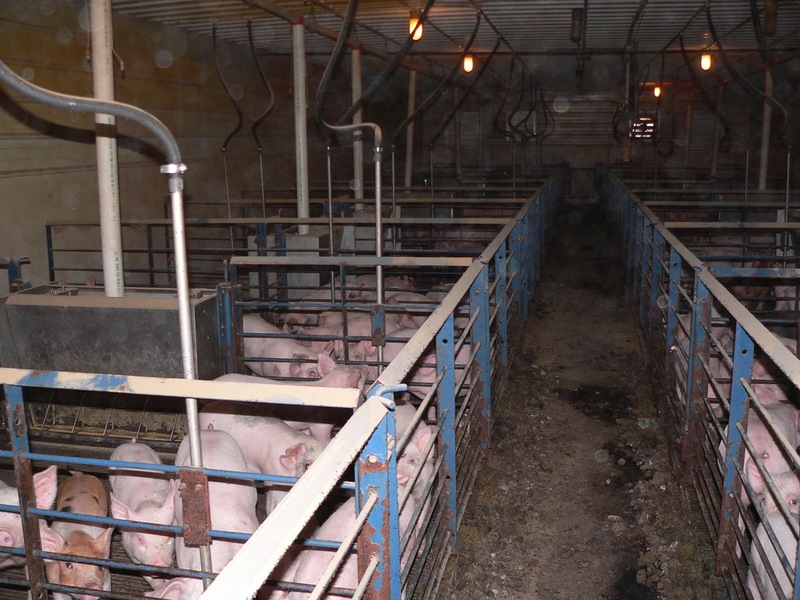 This suffering has been going on since animal production began to be industrialized in the mid-1900s. Peter Singer and Jim Mason first detailed the heinous and hidden operations of CAFOs (concentrated animal feeding operations) in their landmark 1980 book Animal Factories. The last part of Hicks' book is about solutions and his prescription for change, which is worth reading. For the individual, the change is simple. Buy some vegan cookbooks, or look for vegan meal plans on the internet, and stop eating animal products. I enthusiastically recommend this book, because changing the way we eat is perhaps the most powerful action we can take to improve the future prospects of our trampled planet, our civilization, and our health. Anyone can easily do it, with so many wholesome and tasty plant-based options in markets these days. Hicks' book is a great resource for anyone interested in health, animal welfare, wildlife, the environment, climate change, and the end of oil. The book is an especially useful tool for educators - to inform their own lessons, or to assign as student-reading. It's also especially useful for parents because they're shaping the future pilots of spaceship Earth - and frightfully few people, at present, understand the heavy repercussions of our diet choices. I wish Hicks had written more about climate change and the mass wildlife extinctions that will result from climate change and are underway right now. I wish he had referenced the so-important work of Robert Goodland and Jeff Anhang, two World Bank scientists who documented that the livestock sector is responsible for half of the world's greenhouse gases. Their paper "Livestock and Climate Change," published by Worldwatch Institute, is in my view one of the most important papers published in the last decade. Instead, Hicks referenced "Livestock's Long Shadow" by U.N. scientists, which is a valuable analysis, but is outdated by the work of Goodland and Anhang. In spite of these shortcomings, Healthy Eating Healthy World is among the most useful current volumes to review most ramifications of our diet choices. For those who want more in-depth coverage of our environmental crisis including the role of livestock, I strongly recommend Lester R. Brown's Plan B 4.0: Mobilizing to Save Civilization. Lester Brown is founder of Worldwatch Institute, founder and president of the Earth Policy Institute, and author or co-author of more than 50 books on global environmental issues. He has been honored with multiple prizes worldwide. I also recommend these four books on the over-exploitation of the planet and what we can do about it: The Long Emergency, The Post Carbon Reader, The End of Growth, and Deep Green Resistance (or other books by Derrick Jensen). My review of vegan cookbook "Blissful Bites: Food bytes from an inspired chef"
Urban gardening in offbeat settings: My review of DVD "Truck Farm"
My review of new vegetarian cookbook: "Veggiyana: The Dharma of Cooking"
My review of documentary "PLANEAT: Nothing changes the planet as much as the way we eat"
My review of new food film: "What's on YOUR plate?"